The smoke, the noise, and the nuisance. It is time to deal with your vehicle’s exhaust problems. If they can hear you coming from a mile away, then it’s time to visit Wayne’s Auto Repair. Our mechanics provide exceptional work on exhaust systems in Westerville, OH. Do yourself and your fellow drivers a favor. Bring your car to us for affordable and reliable services. 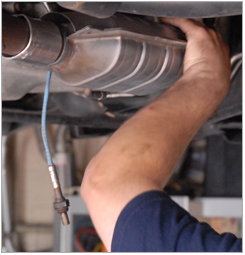 From the engine to the muffler to the tailpipe, we ensure your car or truck’s exhaust systems are in perfect shape. Since a car muffler literally muffles the sound of the engine and the exhaust system, you’ll have a noisy ride if it’s damaged. At the same time, mufflers are rather sophisticated vehicle components. Not just anyone can repair them. However, our exhaust repair experts are equipped with the tools and training to repair mufflers and exhaust systems on all makes and models of cars. Make sure you’re getting quality repairs from certified technicians. Our auto repair shop offers a comprehensive range of services to keep your vehicle running its best. And when it comes to exhaust systems, our skilled mechanics ensure the job is done right. By leaving your exhaust service and repairs to us, you aren’t just getting a quick fix. You’re receiving quality service that will spare you the need for costlier repairs down the road. For courteous service from qualified professionals, we are the right choice. Let our mechanics show you what makes us the area’s premier auto repair shop. Something stinks. You may not smell it, but anyone behind you will. If your car is discharging foul fumes, then it’s time for exhaust systems repair. At the same time, if you notice a decrease in fuel efficiency, then that could also indicate an exhaust system problem. Of course, the most obvious sign is a loud muffler. There are five main components to a vehicle exhaust stem: exhaust manifold, oxygen sensor, exhaust pipes, catalytic converter, and muffler. If any one of these parts experience problems, it directly impacts the performance of your vehicle. The biggest problems that these systems face are rust, corrosion, and normal wear and tear. If you notice any of the above warning signs, it’s time to bring your vehicle to us for an inspection. Addressing any necessary repairs now will save you from higher repair bills later, and not just on the exhaust system itself. Faulty exhaust can start to damage the adjacent components. Cracks or holes in the system may expose other engine parts to heat damage. In fact, the longer you neglect exhaust repairs, the more you are increasing the risk of fire. But we’re here to help. We work quickly to provide all the necessary repairs to get back on the road safely. Silence your noisy exhaust problems by depending on our auto repair shop. We provide comprehensive services and strive to keep them affordable for our customers. Whether you need minor muffler repair or complete exhaust system replacement, you’ll find that we work with your budget. Most importantly, our team is friendly, honest, and always willing to go the extra mile for you. In addition, we offer payment plans and convenient financing for our valued customers. Additionally, we take your time into consideration. If you’re like many people, you depend on your vehicle to keep your busy schedule on track. We know you can’t have too much downtime without your car. That’s why we not only provide some of the area’s most reliable repairs at the most affordable prices. We do them as quickly as possible, too, without sacrificing our commitment to quality. We believe that the best way to earn your repeat business is to treat you right every time. To us, that means quick service for fair prices that maintain the safety and performance of your vehicle. Contact us for service when your car's exhaust system is noisy. We serve vehicle owners from Westerville, Columbus, Worthington, Gahanna, and New Albany, Ohio, as well as the surrounding areas.